Forgot the administrator password on Windows Small Business Server (SBS)? If you can’t log on with other administrator-level account, you’re unable to change or reset the password. So if you’re confronted with this situation where you essentially have no control over your server. What do you do at this point? In this tutorial we’ll show you how to reset Windows SBS 2011 / 2008 / 2003 password when you lost or forgot the administrator password. Because we could not log into SBS as admin, so it’s impossible to install any software on your computer to hack into the Security Account Manager (SAM). Fortunately, with the PCUnlocker boot CD you can circumvent Windows security restrictions and reset SBS administrator password directly. 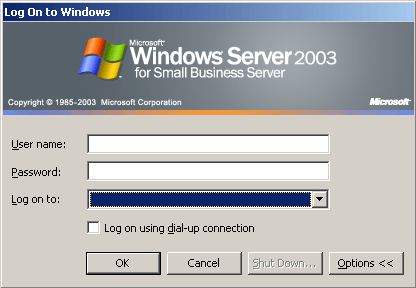 How to Reset Windows Small Business Server Password After Forgotten? Download the PCUnlocker program from http://www.top-password.com. The download file is a zipped ISO image file. Double-click the zip file and the system will display all the contents in a new window. Just drag the pcunlocker.iso file from that window to your desktop or another location you can find easily. Burn the ISO image to an empty CD (or USB flash drive) using the freeware ISO2Disc, BurnCDCC or ImgBurn program. Connect the CD you’ve burned to your locked computer that you want to reset Windows SBS password on. Turn on the computer and change the boot order in BIOS. Make sure the CD/DVD drive is the first boot device. After booting from the CD, you’ll see the WinPE operating system start. Just about half a minute later, you’ll see the PCUnlocker program. It displays all your Windows user accounts. If you need to reset domain user password, please click on the “Reset Active Directory Password” option. Choose a user account and click on “Reset Password” button. The program will unlock / reset your forgotten user password immediately. Click on Restart. Take out the CD from the computer. Now you can log back into your Windows Small Business Server (SBS) using a blank/empty password.